Big bottle. Wax seal. Diam cork. As you progress through the ritual of opening this wine, the moment arrives when you pour the wine from the heavy glass vessel, and there’s an expectation you’ll see an inky black liquid oozing from the neck into your wine glass. But it’s not inky black. It’s light and transparent, with brick red hues like a pinot; unexpected really, but that’s the colour of this nebbiolo. Opening notes of mint and raspberry lead to a wide spectrum of aromas ranging from the floral: violets and lavender, to the herbal: wild heath, sage and anise: to the savoury and dry: black tea, char, white pepper and tomato pizza sauce base (yes, I love balsamic!). There’s strong pencilly notes too – perhaps an oak derivative – but the general tone is in the red-fruited spectrum. The palate runs with a similar reddish theme of raspberry and cherry flavours; a touch of marshmallow sweetness. There’s great drive and depth of flavour, but without the weight – that’s OK, it doesn’t need weight. It’s supple, textured and layered; seductive and savoury; with surprisingly citrussy acid and firm, yet fine, tannin. There’s some smoky char and tar too. It works a treat with food – on this occasion: pork sausage, roast potato, sundried tomato and olives. It has the X factor, of which I am particularly fond yet inadequately equipped to elucidate with any precision. I think the best is yet to come. Hell, it’s still evolving in my glass. I like it, as is obvious by now. I think I’ll start scoring wines in this blog with a simple X factor – yes, or no. OK, that may be a little simplistic. But this is another wine that speaks clearly of variety and place when supped alone, yet evolves and sings loudly when coupled with food. 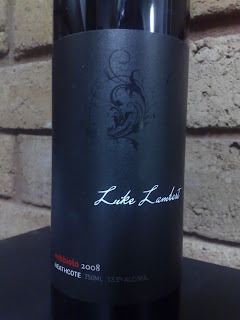 Value: It ain’t cheap at $38 a bottle, but it’s one of those ‘gotta try one’ wines. Producer: Luke Lambert Wines – www.lukelambertwines.com.au – cultish producer, but don’t let that put you off. Based in the Yarra but this wine from Heathcote. Vintage: Good winter rains followed by a warm spring and summer, ending hot in some parts. Generally a good Heathcote year.